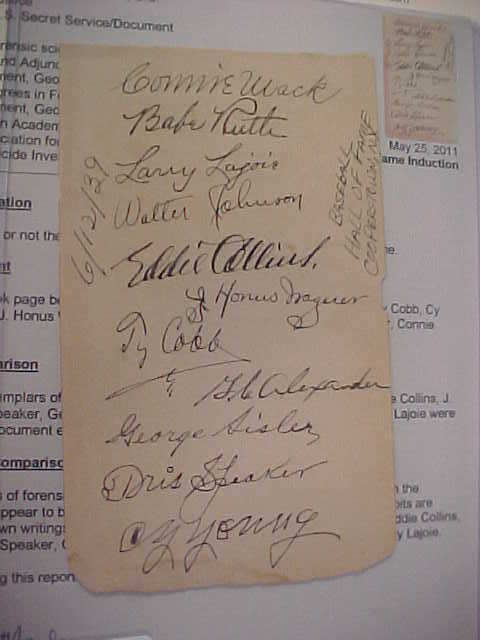 Coach's Corner - 1939 Cooperstown Hall of Fame Induction Autographed/Certified Cut!! Go Back to Lot List 1939 Cooperstown Hall of Fame Induction Autographed/Certified Cut!! This approx. 4.5"x6.5" cut appears to have been from an old autograph album and is beige in color. It is in VG/VG+ shape and comes signed in black inks by C.MACK, B.RUTH, L.LAJOIE,W.JOHNSON,E.COLLINS,H.WAGNER,T.COBB,GC ALEXANDER,G.SISLER, T.SPEAKER, & C.YOUNG! It comes dated from 6/12/39 an the autographs are STUNNING! Fully certified by forensic examiner Christopher Morales. Wow!